Who says all girls have to be sugar and spice and everything nice? 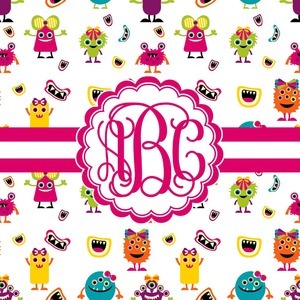 For the little girls that have a big imagination and an adventurous side we have this fun little girly monster pattern. Monsters galore highlight this pattern in colors of hot pink, orange, yellow, green, aqua blue, and purple. Laughing monster mouths dot the pattern throughout. A white band trimmed in hot pink tie everything together. 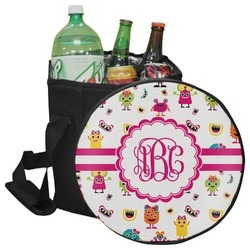 A gorgeous scallop label is added to showcase a personalized monogram.